Today is a very special day for those of us who like our first meal of the day to offer us the convenience of eating with one hand while the other is frantically writing a term paper that was assigned a month ago – the birthday of the Kellogg’s Pop-Tart! Post made a serious blunder by showing their hand too early, and revealed their product before they were ready to put it on the market. Kellogg’s, no doubt twirling the end of its corporate skinny moustache like the bad guy in old-time movies, rushed its own version to the store shelves of America within six months. Kellogg’s called their toaster pastry Pop-Tarts, a nod to the super-cool pop-art trend of the mid-60s. When Post finally released Country Squares, it sounded dull, square and Grandma Clampett-ish by comparison. At first, there were only four flavors of Pop-Tarts: strawberry, blueberry, cinnamon, and apple currant. Today, of course, there are 25 gazillion varieties of Pop-Tarts available to choose from. Kids today have no idea how good they have it. 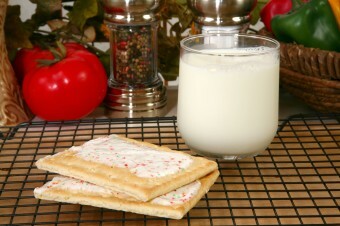 All the original Pop-Tarts were unfrosted for fear the frosting would melt, or even worse, catch fire in the toaster. A couple of years later, they came up with frosted Pop-Tarts with non-melty frosting that would not lead to an inferno, first available in 1967. Nevertheless, in 1992 a fellow named Thomas Nangle filed a lawsuit against Kellogg’s when his Pop-Tart got stuck in the toaster and caught on fire. I have come across several recipes for homemade Pop-Tarts, but I can’t for the life of me figure out why anyone would go to the trouble of paying for the ingredients and baking something that they can so easily and inexpensively pick up at any store. Maybe it’s because I’m lazy. Maybe it’s because I’m cheap. I prefer to think of myself as a purist. After all, breakfast items like Pop-Tarts are all about convenience. If you want to cook a breakfast, there are much better, and healthier options. In the end, if it doesn’t come in a cardboard box twin-wrapped in paper-thin foil, it just isn’t a Pop-Tart.